Shown with Included Cross Charm, & Optional Pearl Charm. Absolutely beautiful 100% solid 14k white gold heart pendant with your choice of included religious charm. 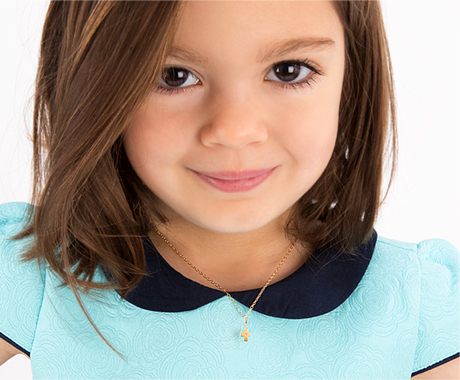 Your necklace includes FREE single side engraving, with the following options; engrave your child's name, initial, or even a monogram on one side and a short message on the back. Personalize it further by adding her beautiful birthstone or other charm. Excellent gift for special occasions like Christenings and Baptisms. This 14k white gold necklace is stunning, the engraving is meticulous and the quality is extraordinary!